VLV Associates, Inc. has the ability to customize package configurations, utilizing numerous materials, to fulfill a variety of soft blister packaging needs. VLV’s on-site machine shop can customize most any blister packaging requirement. One of our three Form/Fill/Seal packaging machines utilized for terminally sterile packaged product is configured in a class 10,000 cleanroom. Additionally, our fully automated Delta Converting Machine can transfer raw materials into finished product utilizing various stations, such as laminating, dispensing and rotary die cutting. VLV’s on-site engineers ensure fast turnaround times on cost efficient custom configurations. 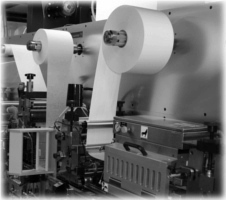 Furthermore, VLV’s thermal transfer and barcode printers offer the ability to print on label stock or directly onto the packaging film, resulting in a clearly and consistently labeled Finished Product.